Here are the squares of the quilt top I've been working on. It is for my friend's youngest - Beckett or Baby Buckett as Audrey says. He was born in July so this will obviously be a post birth gift. The inspiration for this quilt comes from a baby quilt of mine. My mom tells me this quilt was purchased for me at a street fair. I love the vintage fabric (is fabric from the 70s considered vintage? If so, you know what that says about me) and the simplicity of the design. Actually this quilt got me thinking about charm quilts. 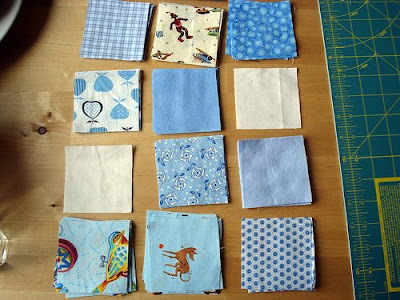 In a charm quilt each fabric is only used once - a great way to use up scraps. More on scraps and charm quilts in January. Lots more. The blocks on Beckett's quilt are all sewn together. Hopefully I'll get a picture up soon for you. Still needs a border. That'll probably have to wait until my fabric gets here. There are a few more pictures on flickr if you're interested. 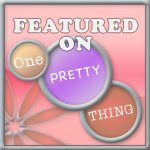 Don't forget about charm quilts or scraps for that matter. More to come. I've got something in the hopper. Today we braved the Arlon IKEA. We managed the usual IKEA craziness (just like the IKEA in Renton) but I left my wallet there. Discovered it was missing at 6:45 this evening. Panicked. Drove back to find that some kind soul had found it and turned it in. Amazing. I'm so very thankful. After nap time we went to an International Bazaar held at an expo arena here. It was full of booths from various countries. Each booth was selling native crafts and wares as well as food & drink. It was crowded and over whelming. Not so good for kiddos (or mommies.) Bryce and I did manage to snag a pisco sour from the Peru booth. We drank many a pisco sour in Chile and had not had once since our trip 6 years ago. We finished the final season of The Wire. What an amazing show. Oh, Pisco Sours!!! I have traveled to Peru a couple of times, and I have had a number of Pisco Sours. Yum! Thanks for the memory! I'm a little drunk and looking through your blog. I miss you guys. Totally out there but it's funny that your friend calls her son Baby Bucket... my son's English name is Beckett, but his Kyrgyz name was pronounced Bucket... we wanted to keep his name as close to the original as possible so shifted it slightly to get Beckett. 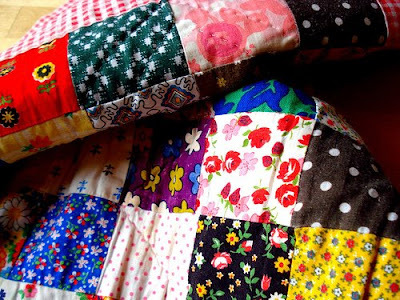 I LOVE charm quilts, or any other scrap quilt. My ggmother made crazy quilts from silk ties and they are a riot of color! You may be getting emails from me asking for quilting help in the very near future. I just closed the Etsy shop in hopes that I'll have a bit of time to work on personal (quilt) projects that were long ago started and never finished.